In each of these sequences, we see that each term, except the first, progresses in a definite manner. 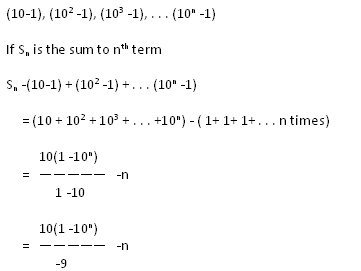 In the first example, we observe that t1 = 2 ; t2 = 4 = 2t1; t3 = 8 = 2t2; t4 = 16 = 2t3 and so on. 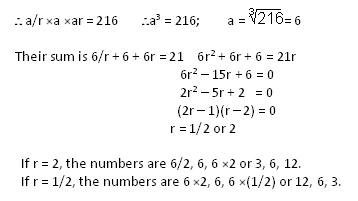 The sequence is obtained by multiplying 2 to the number preceding it. Such sequences are called geometric progressions. a, ar, ar2, . . . Consider a G.P. whose first term is “a” and whose common ratio is “r”. What are its first few terms? 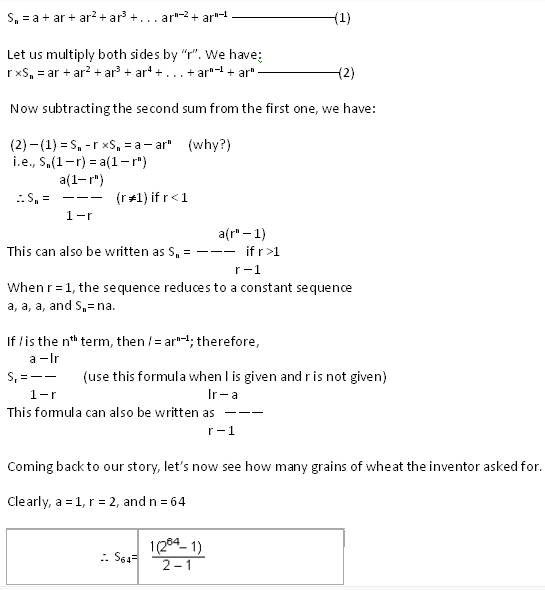 The second term is obtained by multiplying a by r. Thus t2 = ar. 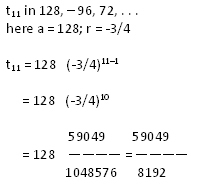 Similarly, the third term is obtained by multiplying t2 by r.
Thus, t3 = rt2 = ar2. 5th term t5 = ar4 = ar 5-1 and so on. Do you see the pattern? 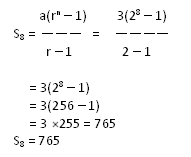 We see that in each term, the exponent of r is 1 less than the number of the term. Find the 10th and the nth terms of the G.P. 3/2, 3/4, 3/8 . . .
Write the first four terms of the following geometric progression whose nth term is tn = 3(–2)n.
Three numbers are in a G.P. Their sum is 21 and their product is 216.Find them? Let the three numbers in a G.P. be a/r, a, ar. There is an interesting story about the inventor of the game of chess. Have you seen a chessboard? The King of Persia was so pleased with the inventor that he offered to him any reward that he wanted. The inventor asked that one grain of wheat be placed on the first square of the chessboard. Two grains on the second, four on the third, eight on the fourth and so on. It is clear that 263 grains (because the chess board contains 8 * 8 squares) are required on the 64th square. As we shall see, although the demand of the inventor appeared modest, in effect it was not. Now let us learn how to find the sum of the first n terms of a G.P. Do you know how large this number is? It was said that the amount of wheat, which the inventor had asked for, would have covered the entire country of Persia with a layer that was more than 7 cm deep. Needless to say, the king was very unhappy when he realized the impossibility of meeting the inventor’s demand. 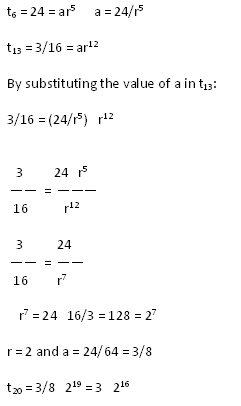 Find the sum of the first 8 terms of 3, 6, 12, 24 . . .
Find the sum to n terms of the G.P. 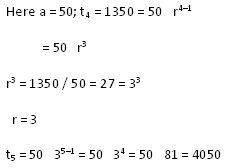 I) Find the common ratio and write the next three terms of each of the following G.P. -3, 1, -1/3, . . .
-2/3, -6, -54, . . .
3/2, 3/4, 3/8, . . .
-1/6, 1/2, -3/2, . . .
5, 10, 20, . . .
II) Find the indicated term in the following G.P. t11 in 128, -96, 72, . . .
t4 in 100, -110, 121, . . .
Write an example for G.P. .
What is the common ratio of the series 4, –8, 16, –32, . . . ? The nth term of a G.P. . is 2(0.5)n-1. What is its common ratio? What is the common ratio of the G.P. . 1, -1/2, 1/4, -1/8, . . . ? 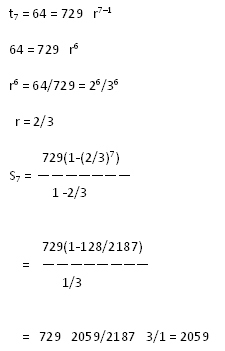 What is the common ratio of G.P. . 1, -1/3, 1/9, -1/27 . . . ? If a,b,c are in G.P. . is it true that a = bc? In a G.P. . the 6th term is 24 and the 13th term is 3/16. What is the 20th term? The first term of G.P. . is 50 and the 4th term is 1350. Determine its 5th term. Find the values of x so that -2/7, x, -7/2 are three consecutive terms of a G.P. .
How many terms of G.P. . 3, 32, 33, . . . are needed to give the sum 120? Given a G.P. . with a = 729 and 7th term 64. Determine S7. Write an example for G.P. 3, 12, 48, 192, . . .
What is the common ratio of the series 4, -8, 16, -32, . . . . ? The nth term of a G.P. . is 2(0.5)n-1. What is the common ratio? What is the common ratio of G.P . 1, -1/3, 1/9, -1/27 . . . ? If a, b, c are in G.P. is it true that a = bc? In a G.P. the 6th term is 24 and the 13th term is 3/16. What is the 20th term? The first term of G.P. is 50 and the 4th term is 1350. Determine its 5th term. 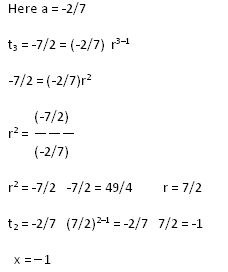 Find the values of x so that – 2/7, x, – 7/2 are three consecutive terms of a G.P. How many terms of G.P. 3, 32, 33, . . . are needed to give the sum 120? Given a G.P. with a = 729 and 7th term 64. Determine S7.